↑ M.P. Barnett and J.F. Capitani, Modular chemical geometry and symbolic calculation, International Journal of Quantum Chemistry, 106 (1) 215--227, 2006. ↑ Harries, J. "Area of a quadrilateral," Mathematical Gazette 86, July 2002, 310-311. ↑ R. A. Johnson, Advanced Euclidean Geometry, 2007, Dover Publ., p. 82. ↑ E. W. Weisstein. "Bretschneider's formula". MathWorld -- A Wolfram Web Resource. 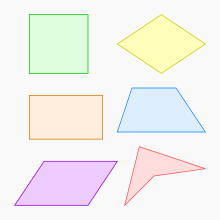 ↑ 6.0 6.1 Mitchell, Douglas W., "The area of a quadrilateral," Mathematical Gazette 93, July 2009, 306-309. ↑ Hoehn, Larry, "Circumradius of a cyclic quadrilateral," Mathematical Gazette 84, March 2000, 69-70. ↑ 8.0 8.1 8.2 8.3 Altshiller-Court, Nathan, College Geometry, Dover Publ., 2007. เอริก ดับเบิลยู. ไวส์สไตน์, "Quadrilateral" จากแมทเวิลด์. หน้านี้แก้ไขล่าสุดเมื่อวันที่ 26 ธันวาคม 2561 เวลา 17:45 น.